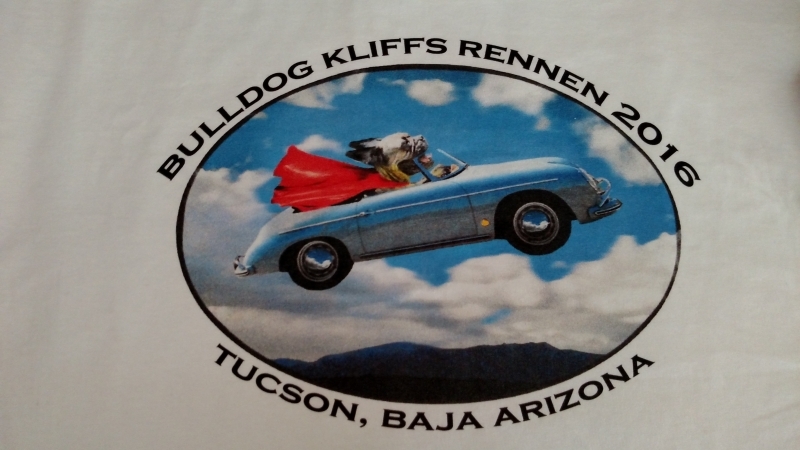 The Arizona Outlaws 356 Club celebrated their recent reorganization and incorporation with their annual the Bulldog Kliffs Rennen event. 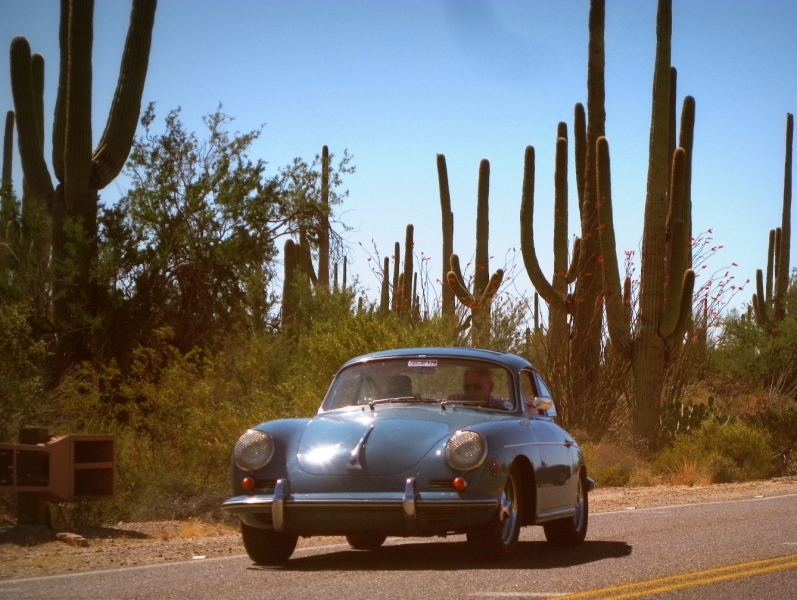 Named after a much-loved inaugural event held in the Bulldog Mountains, East of Phoenix, the event was organized by Tucson resident Steve Proctor with a decidedly local flavor. 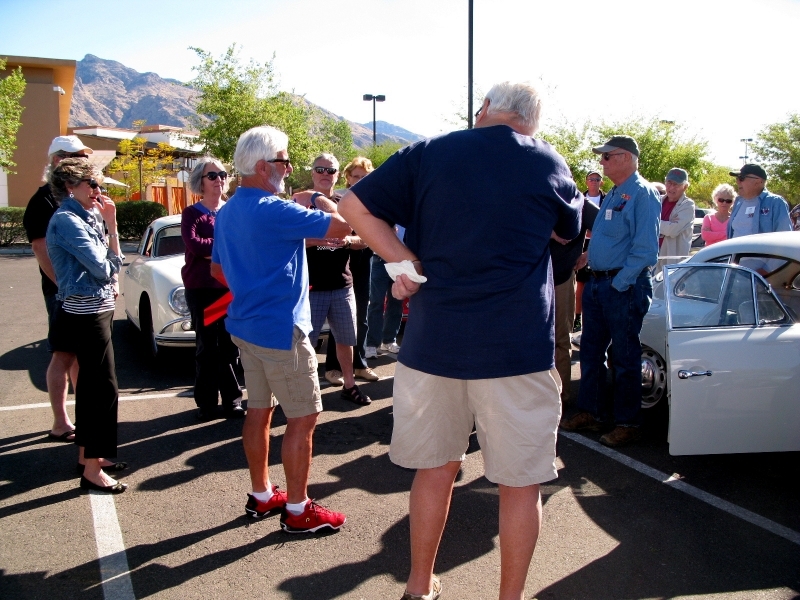 Outlaws from Arizona, California and New Mexico enjoyed the splendid desert Spring weather and Tucson western hospitality offered by the event. 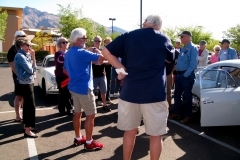 The group assembled Friday noon for the kickoff event at the Pima Air and Space Museum, cited by CNN as one of the ten best airplane museums in the world. 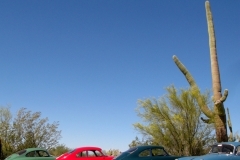 The museum provided reserved parking right up front and scores of visitors to the museum stopped before entering to take pictures of the cars lined up like multicolored jellybeans in the April sun. Dennis Crowley, former docent at the museum and pre-A owner, welcomed the Outlaws with an overview of the museum and tour of Hangar One, the first and largest of the four large hangars on the 80 acre grounds of the museum. Following this introduction and tour, the group dispersed throughout the grounds to view over 300 diverse aviation / aerospace artifacts including a German V-1 Flying Bomb, US and foreign fighter and bomber aircraft from pre-WWII to current, an SR-71, Mercury and Gemini capsules, a Boeing 787 Dreamliner prototype and so many more. Many took advantage of the tram tour that wound through the grounds, with avid docents providing a wealth of aeronautical information and history. Friday evening found the Outlaws at the beautiful foothills home of Larry and Nena Ashton who provided a bartender, server, open bar and delicious gourmet buffet for the hungry and thirsty horde. A special treat was the Ashton's garage which provided access to Larry's Pre-A, A and B 356s, as well as his and Nena's other automotive jewels. 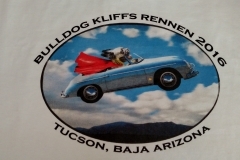 Outside, club treasurer Bob Smith was doing a land-office business selling the seriously cool event tee shirts and Arizona Outlaw 356 Club swag. 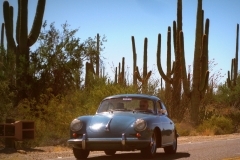 The event resumed Saturday morning with a desert drive West of Tucson, providing soaring views of the mountains that surround Tucson and acres and acres of saguaro cactus and ocotillos adorned with vivid Spring blossoms. 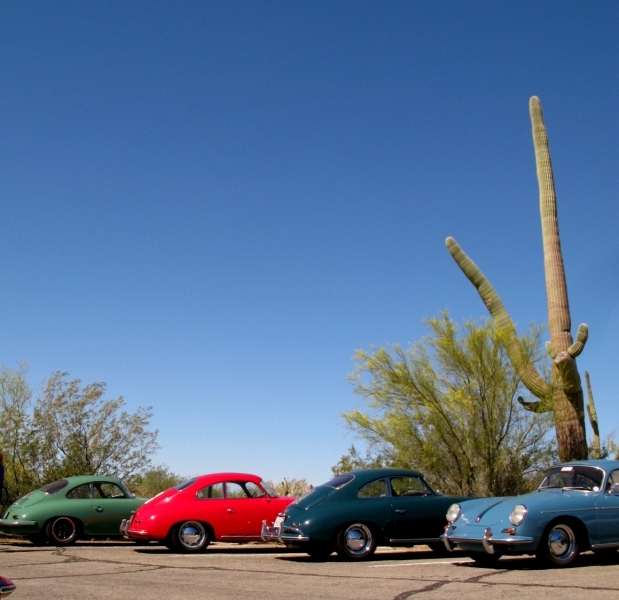 Mary Jane Oring led the drive in her '64 coupe to the ultimate destination, the Arizona - Sonora Desert Museum. The route, planned and documented by Steve Proctor was progressively challenging, with the final 40 minutes on narrow, winding roads with tight turns, elevation changes and decreasing radius turns - oh, and the ubiquitous bicyclists navigating the roads with no shoulders, much less bicycle lanes. All Outlaws survived the drive and spent the afternoon viewing desert flora and fauna, including hummingbird, avian, reptile, javelina, desert cat, bighorn sheep, etc. sanctuaries. Most had lunch at the museum and when finished with the tour, had their choice of two pre-planned and documented routes home. 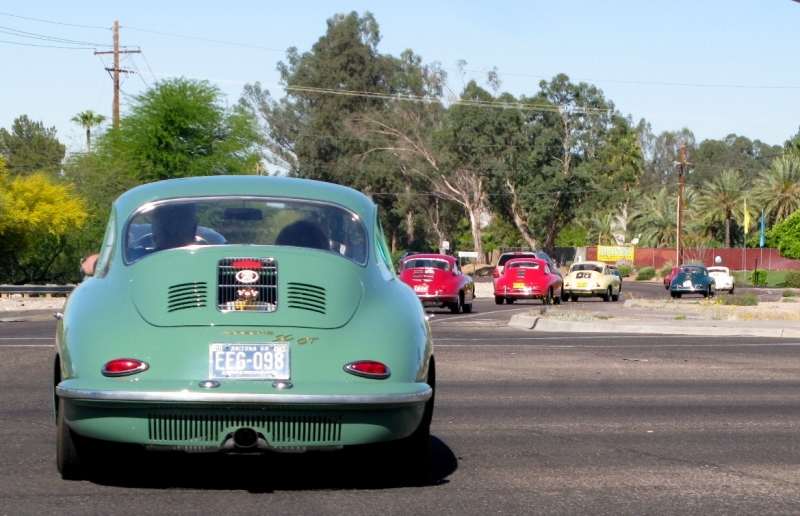 Both drives included the narrow, tight and winding Gates Pass. 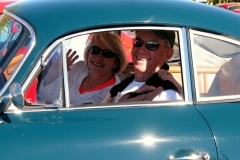 The "fun route" also included a section of road that rivaled a roller coaster, with its steep up and down hills and sharp turns. By informal poll, most of the Outlaws accepted the challenge of the fun route. The event concluded Saturday night with dinner at the historic adobe El Corral steak house in Tucson. Outlaws dined on prime rib, filet mignon, grilled salmon and chicken in the ambiance of the 90 year old Old West Abobe Room, richly adorned with historic cowboy memorabilia. By all accounts, the Outlaws had a great time, but the luckiest guy in the event? That would have to be Outlaw Mark Lauver of Prescott. 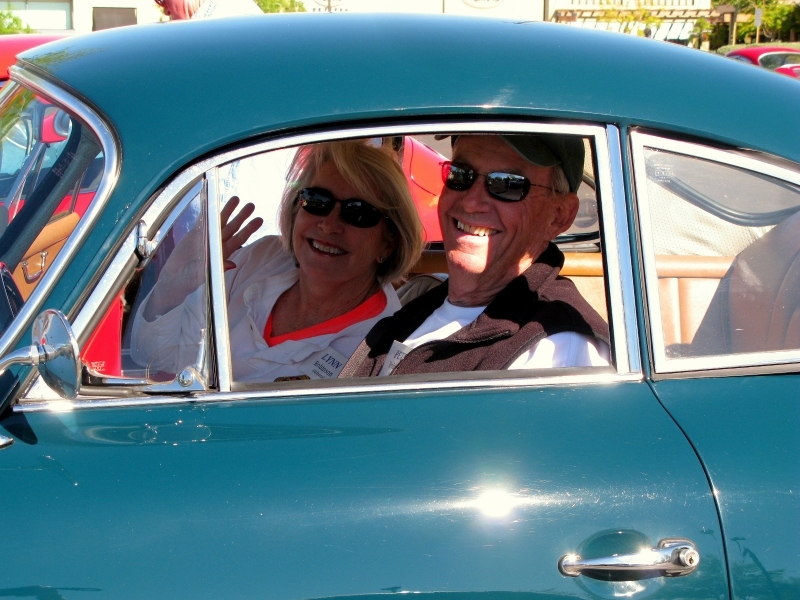 Mark made the good decision of offering San Clemente's own Jack Staggs a ride to the weekend's events and ultimately, a turn at the wheel of his Super 90 Coupe. Between Saturday's Desert Museum tour and the El Corral dinner, the ever-generous 356-whisperer Jack could not resist putting his hands on Mark's car and after a couple of hours of Jack's massaging, the doors closed properly, the engine ran like never before and Mark was left beaming. Now that the word is out, Outlaws are hoping Jack will visit again at the 2017 event and are already lining up to offer him a turn at the wheel of their cars! !